I recently opened a magazine store. On our shelves I can see a magazine with no cover illustration, just masthead and contents, text on plain white. It’s called Riposte and it always looks like that. It also happens to be one of our best sellers. Yet only last month The Huffington Post reported on the increasing importance of the magazine cover. As much as the iPod had influenced the design of music album covers, it argued, the internet and digital apps were similarly influencing the look of magazines. I mention this while waiting for the next issue of Dazed. There’s fair bit of anticipation around this because the art director Jamie Reid has commissioned four different covers. Reid has also said every issue will be designed around the content and that all future editions with be completely different to each other. This idea of content driving appearance is interesting. I don’t think it’s where Reid is headed but it’s well underway in other areas and explains what underpins a species of successful (and disproportionately local) magazines that justify talk of a print magazine revival. I’ve worked across the publishing spectrum but a move into health communications ten years ago alerted to me developments that characterise many of these magazines, which fall predominantly into the lifestyle category. My comms work followed a hefty stint in literary publishing, a niche employing its own rarified, almost coded terminology that often infiltrated book packaging and was thought to confer an aura of elitism that encouraged sales. Similarly, when I started developing patient information resources, most of the material was produced by health professionals who were often the only people able to understand it. And it looked awful. Yet more enlightened practice did emerge with adoption of accessibility guidelines and efforts to target and message specific audiences with engaging material to encourage action or compliance. This has moved on to user-led content where personal accounts or testimonies shared by everyday people about their illness are more likely to be trusted and accessed by the similarly afflicted. Kinship. Kinfolk. And this what runs through the likes of Lagom, Hole & Corner, Ernest Journal, Another Escape and other new magazines which intelligently ride the zeitgeist for craftsmanship or the handmade while focusing on people making a living from their passions – people who make things, people who are not always craftspeople, people who could be you or me. Personal stories, journeys and creative inspiration are delivered in a well-judged mix of the conceptual, the down to earth and the overlooked. At a glance these magazines look generic (there’s been criticism) and design-led but they’re considerately put together with more going on than meets the eye – Lagom is a typographic masterclass. Photography across the genre is hitting new heights and finding innovative narrative threads (Another Escape, Huck) structured with spare elegance and printed in full-bleed luxuriousness. It’s also true their gaze falls elsewhere. Works That Work is a newish magazine by the typeface designer Peter Bil’ak that puts a premium on readability to explore various expressions of creativity largely ignored by design or style publications. He asserts that creativity is not the preserve of professional artists and designers. Bil’ak told the The Atlantic earlier this year that he doesn’t much go for design magazines: ​‘I have always felt that design discussion stays within a strange bubble… and makes little effort to make the discussion relevant for a wider audience.’ In the same camp is the more whimsical Uppercase from Canada which also trawls for overlooked or hidden creativity. A wondrous grid of letterpress ham radio cards from the 1920s to the 1950s (issue 20) illustrates this perfectly. It’s also an observation that awareness of hidden creativity – or design for non-designers – increasingly populates social media postings. 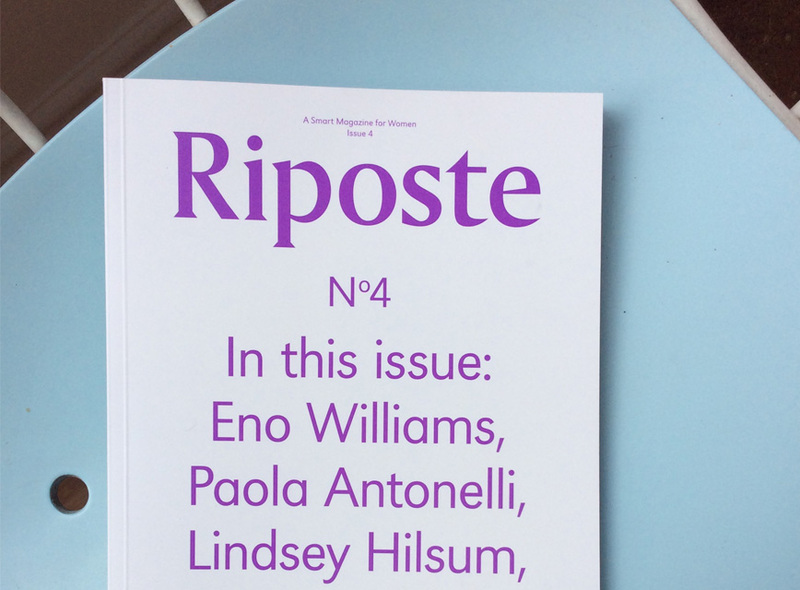 Uppercase also tilts at a DIY ethos that runs through a clutch of the leading alternative women’s magazines – Frankie, Oh Comely, Betty and others that similarly push content to the front. Although in a slightly different category, The Gentlewoman has become a market leader highlighting a parade of unlikely, low-key or barely known interviewees, eschewing celebrity in favour of authentic lives, unheralded achievements and attainable aspirations. Just like Riposte, which has no interest in cover stars at all.